Though ‘seven’ has a reputation for being a magic number, perhaps ‘twenty-five’ will soon join its ranks: the Twenty-Five Club has worked its magic over the years by donating millions of dollars to support newborn medicine, specifically prenatal and neonatal research and clinical care, supported by Magee-Womens Hospital. The magic in question is made up of equal parts dedication and an enterprising spirit. In the 75 years since the club’s founding in 1939, this auxiliary group, comprised exclusively of women, has helped to purchase state-of-the-art equipment and has funded infant and critical care research on a myriad of topics. The mission of the club—to support newborn medicine and specifically pre-natal and neonatal research and clinical care supported by Magee-Womens Hospital—is a labor of love for the club members, whose legacy of philanthropy has had life-altering, and life-saving, consequences. “The mission is the same, but the projects have evolved as the technology has evolved,” said Barbara Mendlowitz, a 12-year member and the club’s publicity chair. One of the Twenty-Five Club’s earliest projects was to purchase Thermo Control incubators, the first incubators in Pittsburgh. The club also donated Magee’s Neonatal Intensive Care Unit (NICU) and a neonatal research laboratory. In 2011, the women established a Fetal Diagnosis and Treatment Center to enable doctors to perform in-utero surgery to treat Twin-to-Twin Transfusion Syndrome, a disease of the placenta that affects identical twins, and over the years, they’ve provided funding for many other neonatal research studies, including RH disease, jaundice and spina bifida. Membership in the Twenty-Five Club is limited to 25 women at a time, though the roster also includes lifetime and associate members. “It’s a really interesting mix of young and old, bright, articulate women,” said Mendlowitz. It all began in 1939, when a group of prominent women in the community met regularly to play bridge at the home of Lillian Reese. She and 24 other women formed a club focused on supporting infant health, initially at Children’s Hospital. The focus shifted to Magee (known then as Elizabeth Steele Magee Hospital), when the hospital developed an infant research department in the 1940s. As their prestige in the community grew, Reese realized that, while the membership would always be limited to 25, there were countless other potential donors who supported the group’s ideals. Fundraising then began in earnest. Previous fundraisers have included Christmas balls and luncheons and, in the past, a behemoth yard sale known as The Sale in the Park, which generated annual sales of $900,000 by 1992. Several years ago, the Twenty-Five Club established the aptly named Cradle Will Rock benefit, in which custom-made chairs are auctioned off. The focus of the Club’s fundraising is always evolving and is based on advances in technology. They hold monthly meetings, often hosting physicians who educate the group about current and future monetary needs to conduct the critical research projects of Magee-Womens Hospital and the Magee-Womens Research Institute. The women’s philanthropy group will celebrate its 75th anniversary with a fundraising gala at the Omni William Penn on November 1. 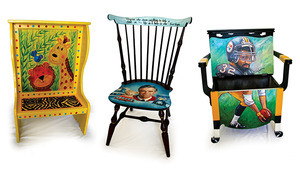 In addition to dinner and dancing, 30 chairs will be available for auction, hand-painted by various community artists and signed by local celebrities.